The following blog is a reconstruction of an actual feedback on our MyTalent Program that helps in scientific stream selection based on ones' strengths. The feedback was received by MapMyTalent from a student of 1st year at Delhi University Graduation course whose younger sister, then in class X took our MyTalent program to decide about her Stream choice. 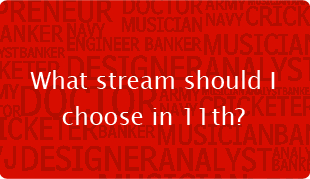 I was talking to my little sister the other day and she was telling me how confused she is about what stream and subjects to choose in class 11th. Having myself once been unsure of what subjects and stream will suit me best, I can completely understand the pain and trauma that you all go through because of this uncertainty. That is why I have decided to help you sort this confusion out. The MapMyTalent experts had helped my little sister a great deal in figuring out the science behind choosing subjects that best suit my strength and aptitude. They had come up with a unique solution just for students whoa re in Class IX and X … matching, comparing and analyzing all my strengths and abilities. Infact I realized that the solution is also very very helpful for those in Class XI and XII to help them choose their RIGHT-FIT careers as well. All that my sister had to do was take MapMyTalent's MyTalent Test at MapMyTalent. At the end of the test she got a detailed report explaining what her key strengths were (Her Aptitudes, Her Personality and her Interests) and what careers and subjects will she do well in. Believe me; it was as simple as that. And the report was completely accurate in its analysis because when I saw the result, I could completely relate to everything that it suggested to my sister. The MyTalent Test primarily judges a person across seven different aptitudes and twenty eight different personality traits and understands the Unique Talent pattern in the student. The responses submitted by each students in the Test are then analyzed by the experts at MapMyTalent after which the student is presented with two recommendation reports (one a Detailed Report and another a Summary Report) which contains not only the suggestion for the Best Suited stream but also gives the top three careers that an individual should look for. Unlike other tests and reports which are never to the point (infact many reports that i have seen give as many as 20 options to the student ... making the student even MORE CONFUSED), the MapMyTalent Reports gave top THREE CHOICES. I really liked the presentation of the Report and really feel that each and every student of Class IX, X, XI and XII should take MyTalent Assessment and find their BEST FIT careers. So there you go! You have to give the test a try to explore and understand your strengths and abilities. It will make you much clearer about what subjects and stream to choose in class 11th. Take the MyTalent Test right now and get the best career guidance.